Current Stanley Cup champions, the Dallas Stars would finish the 1999-00 season 1st in the Pacific, again advancing to the final that spring. 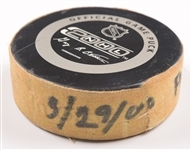 The season would also prove special for Brett Hull, with the HOFer tallying 24 playoff points in just 23 games, along with scoring his 1100th career point. Occurring in a 4-1 victory against Florida on March 29th 2000, we have the puck Hull used to secure his 1100th point, with this his 935th NHL career game. 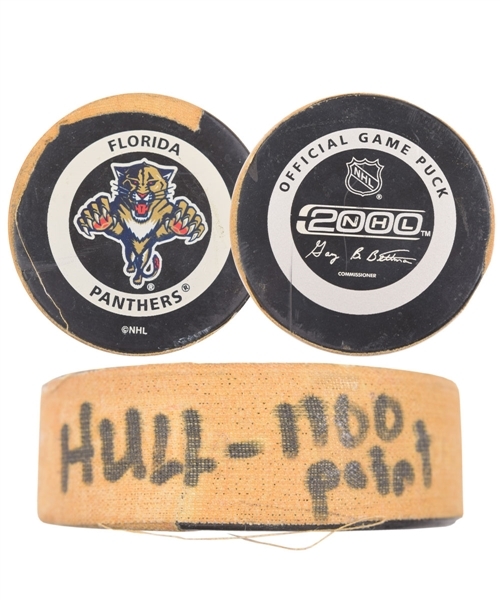 Netting 3 assists in the contest, the official Panthers game puck has tape wrapped around the side with the particulars handwritten, including “3/29/00 Florida Hull – 1100 point”. A signed LOA from Brett Hull will accompany. 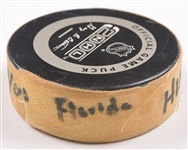 The puck exhibits light to moderate wear, with a thin slice over the NHL logo, with some darkening/yellowing to the affixed tape.